When you take a person, train them to kill, you get someone that usually does not miss when they aim. This veteran could have hit people if that was what he wanted to do. His shots were called random but that in itself shows he was not aiming to hit people. Shoppers were terrified all the same. Justice in this case is that this veteran needs help and it looks like he will finally get it but true justice would have been to get him help before it ever reached a point like this. Every month, Americans return from military duty in Iraq and Afghanistan having seen intense combat. Researchers estimate that nearly 20 percent of the 1.6 million veterans of these wars suffer from post-traumatic stress disorder. That’s a cold statistic. Each of those more than 300,000 veterans has a face and a name. One of them is Michael Thomas Mason. He’s the 27-year-old Springfield man who was shot and wounded by two Eugene police officers Dec. 15 after Mason fired shots in the Valley River Center parking lot. Gardner called a news conference Tuesday to announce his finding that the two officers who shot Mason were justified in doing so. It was a reasonable decision, even though it is certain to be criticized by some in the community who believe the city’s police officers are too quick to resort to lethal force. After randomly firing multiple gunshots that injured no one and struck a car in the parking lot, Mason left the mall and drove to the Santa Clara area. Police confronted Mason as he sat in his stopped sport utility vehicle, ordering him to put both hands out the window. Mason dropped a handgun out the window but reached back into his vehicle several times, not responding to officers’ commands and leading them to believe he might be reaching for a second gun. The officers fired three times. Two bullets hit Mason, one striking his spinal column. In addition to announcing that the police shooting was justified, Gardner said he would not prosecute Mason for the mall shootings, saying the veteran was in the throes of a PTSD episode at the time of the incident. Gardner cited Mason’s extensive combat record: He arrived in Iraq as a member of the 173rd Airborne Light Infantry Brigade shortly after the U.S.-led invasion in March 2003. Mason saw repeated and intense combat during his yearlong tour in Iraq, and he was cited by superiors for bravery under intense and prolonged fire and his efforts to protect fellow soldiers. Mason, who also served as a combat medic, later was for a year sent to Afghanistan, where he also saw heavy fighting. Post-traumatic stress disorder, or PTSD, is a condition closely associated with the battlefield. But Michael Ferrara developed PTSD without going to war — he spent three decades living and saving lives in Aspen, Colo., as a search-and-rescue man, ski patrol officer, paramedic and firefighter. After several years, horrific images from those rescues started playing over and over in his mind. "Little by little, it just started to build, and then one day, the slideshow that was all these events started running in my head and I couldn't control it," Ferrara says. He was seeing "an eviscerated man from an automobile crash"; burned, dismembered bodies; and climbers who had fallen 2,000 feet. Therapy has helped him, but Ferrara says such rescues are very difficult, especially when his good friends are killed, which has happened numerous times. We have to recognize that having this stuff mess with your head is not abnormal. You're not supposed to see stuff like this. "The last one was a very close friend of mine in December of 2008 who had been killed in an avalanche," Ferrara tells NPR's Audie Cornish. "I was at bottom at that point." Ferrara says he handled it by isolating himself. "I didn’t leave the house," he says, "and I had begun using Percocet that had been prescribed for physical ailments for my emotional trauma." Ferrara isn't alone in his experience — other rescuers and first responders have had to cope with their own post-traumatic stress. Hampton Sides, a writer for Outside magazine, covered Ferrara's case and other cases of civilian PTSD in the January issue of the magazine. "It's only recently become apparent that PTSD is rampant among the community of first responders," Sides says. "I think that the last community that has come to recognize this has been these mountain communities — these people who essentially get to do what they love to do, and yet they come across this trauma. They see these horrible things — often people that they know." Sides says that part of the reason for the lack of diagnosis of PTSD is the culture of the responders themselves. "There's the kind of 'he-man' quality to this," he says. "These guys don't like to recognize when they're hurting." Ferrara recounts the story from several years ago of a young man riding his motorcycle on a mountain road who was hit by an 18-wheeler. "He was conscious when I got there, begging me not to let him die," Ferrrara says. "He died on me, in my arms. And I talked to a psychologist afterward, and she said, 'How are you doing?' And I said, 'Ah, I'm fine.' And she said, 'Why would you be fine? You've just had a man beg for his life die in your arms. Why would you be fine after that?' "
A Pennsylvania man was arrested for snatching video games out of the casket of a teenager who died in a Christmas Day car crash, police say. They said Jody Bennett, 37, grabbed a Game Boy from the coffin of family friend Bradley McCombs, 17, during a Monday night wake in Montgomery Township, 65 miles northeast of Pittsburgh. The boy's uncle, Robert McCombs Jr., confronted the robber outside the funeral, and Bennett handed back the Game Boy, The Tribune-Democrat reported. However, when the uncle returned to the open-casket viewing, the family realized that three game cartridges and a Game Boy light also were missing. The stolen items were worth $46.90, according to The Tribune-Democrat. Police recovered one of the cartridges but don't know what happened to the other items, Sgt. Michael Schmidt told The Associated Press. "I can confidently say this is the first time in my 22 years that I've had anybody go into the funeral home while the family was there and take something right under their noses and try to get away with it," Schmidt said. Bradley McCombs -- an avid video games player -- died on Christmas morning when he lost control of his SUV and smashed into a utility pole. EUGENE, Ore. - The son of a retired Eugene police officer, Michael Mason returned from two tours of the Middle East a decorated war hero. According to documents obtained by KVAL News, the Army awarded Mason with awards for valor and heroism during wartime. Mason “voluntarily exposed himself to direct and effective enemy fire” to protect his fellow soldiers in 2005, according to award recommendations. "He was the kind of young man that every family in every community hopes to raise," said Alex Gardner, the Lane County district attorney. Mason is now mostly paralyzed from the neck down, the result of being shot by Eugene police officers responding to a report of shots fired at a shopping mall. Four years and two tours of the Middle East took a traumatizing toll on Mason’s mental stability. “He watched firsthand the loss of dozens of his fellow soldiers during his combat service,” said Mason’s sister Sara Mason. Gardner said Mason witnessed the deaths of at least 26 fellow soldiers in Iraq and Afghanistan. And two Wednesdays before Christmas 2010, Mason went shopping at Valley River Center - and snapped. The good news is that Bank of America is working with him now to save his home. The bad news is how it got to the point where he had to worry about how to support himself in the first place. HOUSTON -- A local veteran is struggling to hold on to his home and he's not alone. Since the foreclosure crisis began four years ago, it has claimed five million homes. John Aguirre says his heart is in pieces. "Sometimes I just want to swallow a bullet," the 58-year-old man said. A veteran of the Marine Corps and U.S. Army who served in Vietnam, Aguirre later worked for a lawn and tree service until old injuries and declining health forced him to quit. "I've been going to the V.A. hospital for depression, stress, heart problems and blood pressure," said Aguirre. He's in the process of seeking full disability benefits from the V.A., but with no income to speak of, Aguirre had no choice but to move in with his mother who passed away in April. When the established service organizations fail to adapt to take care of all veterans, they end up with shrinking numbers resulting in less power to be heard by Washington. 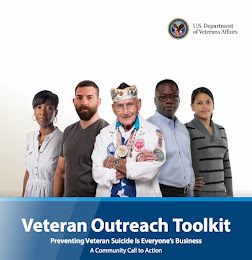 Above that they understand that as an organization helping veterans, they need to change the way they do things to fit the needs of newer veterans as well as older ones. December 29, 2010, 7:42 a.m.
LEAVENWORTH, Kan. (AP) — The Veterans of Foreign Wars' post in Leavenworth traditionally was dominated by aged ex-servicemen. But in recent years a revolution has occurred in the Kansas Army town, with a new young leadership transforming the post into a center providing support and entertainment for male and female veterans of all ages and conflicts. It's a scene that the VFW, considered the nation's largest and most active organization advocating for military veterans, is burnishing as several hundred thousand of its mainstay members — World War II veterans — die each year. "We have to battle that perception that we are an old man's club," said Lynn W. Rolf III, a 36-year-old Iraq war veteran and the commander of the Leavenworth post. "We have to transform ourselves or we won't survive." Since its peak membership in 1992, the VFW's ranks have fallen from 2.17 million to 1.49 million nationwide. About 500,000 of its members are above the age of 80 while just about 100,000 are under the age of 39. John Barrett said the WWII vets at an Alabama post treated him with such disregard when he returned from Vietnam that he turned his back on the organization back in the 1970s. "They said it wasn't a real war, that we just went over there and messed around, that we were nothing but a police action and we didn't see what they called 'real combat,'" Barrett said. "They called us 'baby killers,' and they didn't feel like we should even be in their organization." When Rolf walked through the door at the Leavenworth post in 2007, he found a bunch of old-timers drinking at the bar. Sure, they understood combat and all the things that are hard to explain to people who haven't been there. But Rolf, who had been drinking too much and had been struggling with bad memories of the war in Iraq, said members seemed more focused on what kind of liquor to stock at the bar than with providing support for returning troops and their families. While Cummings has had success re-acclimating, other Rhode Island National Guardsmen had a tough year. Three guardsmen committed suicide within 30 days early in the year and a fourth died two months earlier in an accidental drowning. They are called citizen soldiers. They work as prison guards, police officers, investment portfolio managers, Harvard University professors. And at any moment, they could be called to fight a war or lend a hand during a natural disaster and leave their jobs and loved ones behind. They are Rhode Island National Guardsmen and women, and they trace their history to the first Colonial defense force started in Portsmouth in 1638. Today, they number 3,300, with 2,200 in the Army National Guard and 1,100 in the Air National Guard. They serve at the behest of the U.S. president and Rhode Island’s governor, fulfilling federal and state missions under Adjutant Gen. Robert T. Bray’s leadership. And since the Sept. 11 terrorist attacks, they’ve seen the country’s second-highest per-capita deployment rate behind South Dakota with 5,600 mobilizations — a figure only surpassed in Rhode Island during the Civil War. They are in demand because they are skilled in providing support services to soldiers on the frontlines as military police officers and helicopter pilots. In addition, as the governor’s militia, 614 Rhode Island National guardsmen and guardswomen helped with traffic control and evacuations during the spring floods. Another 206 were activated to assist during Hurricane Earl. “There’s a minuteman ethos to drop their figurative plowshares and pick up their muskets,” says Lt. Col. Denis J. Riel, spokesman for the state Guard. SANTA FE, N.M. -- The pregnant wife of a Marine, who died after a shootout with state police in Santa Fe, gave birth to their second child on Thursday. Lawrence Lujan said his friend, Roxanne Gonzales, gave birth to a baby boy named Cruz. Lujan said Gonzales is also mourning the loss of her husband, Diego Gonzales. State police said they tried pulling Gonzales over after getting reports he kidnapped his wife and their other child, but the Marine shot at them before turning the gun on himself. A TSA spokeswoman confirmed that Diego Gonzalez was a TSA behavior detection officer who had been employed at the Albuquerque Sunport for almost four years. The police are not sure if is this veteran shot himself or not but all seem to agree PTSD was behind it all. It didn’t come in time for the 27-year-old Pecos High School graduate, who was suffering post-traumatic stress disorder after two tours of duty in Iraq and another in Afghanistan as a U.S. Marine Corps sniper. He died late Tuesday in a shootout with police on Interstate 25 south of Santa Fe. It’s still unclear whether the fatal shot came from state police or from Gonzales’ own gun. That won’t be determined until an autopsy is completed by the state Office of the Medical Investigator in Albuquerque. Reading this my knee-jerk reaction was anger. A veteran living on the streets begging for money is more heartbreaking for most people than to see someone else asking for money. We give to charities, like the Salvation Army, never knowing where our money or clothing goes because we just want to help someone with less than we have. We don't know how they ended up homeless, if it was their "fault" or not any more than we care if they are on drugs or drinking because as humans they have basic needs like clothing, shelter, food and to know that someone thinks they are worth helping. When it comes to veterans, most of us look at them differently because they were willing to die for the rest of us. To see them living on the streets after that is heartbreaking. To have someone claim to be a veteran just to get more money makes us wonder if every other person we see begging claiming to be a veteran is really a veteran or not. Then I finished reading this coming to the part where it says this faker was dishonorably discharged. I wasn't so angry after that. I wondered if he was one of the 26,000 or more discharged under personality disorder instead of taken care of because they had PTSD. This kind of discharge left them without everything. 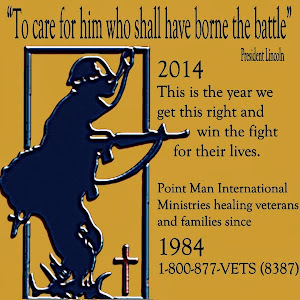 No income, no help from the VA or service organizations, no jobs and no hope. It would be very interesting to find out why he was discharged but I doubt we'll see any reports getting further into this. LOUISVILLE, Ky. (WDRB Fox 41) -- Police say a homeless man went too far when he impersonated a veteran. Paul Kaemerer was apprehended by officers Tuesday afternoon when he was seen walking near the I-264 westbound off-ramp to eastbound U.S. 31. A police citation indicates that he was holding a sign that said, "homeless hungry veteran." When officers asked Kaemerer to prove that he was a veteran, he couldn't do so, according to the report. 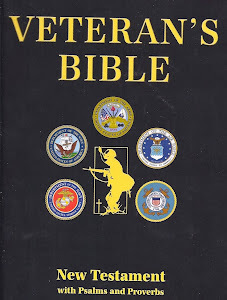 "It is common knowledge that persons will lie about their veteran status to attempt [to] gain additional monies from begging," the citation states. Police say Kaemerer was disturbing traffic and had previously been warned not to beg for money at that location. Kaemerer eventually told them that he had been dishonorably discharged from the military and that he was begging for money, police say. He was charged with misrepresenting his military status, disorderly conduct, standing on a limited-access highway and criminal trespassing. Attorney General Richard Blumenthal on Tuesday endorsed the efforts of veterans groups to get information from the Department of Defense about troops wrongfully discharged on the basis of personality disorder. 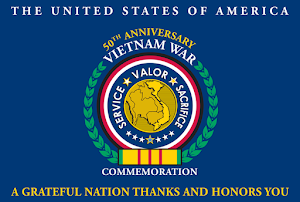 Vietnam Veterans of America and its local chapter in Hartford filed a federal Freedom of Information Act lawsuit in federal court in New Haven Dec. 16. The suit seeks information from the defense department about why some 26,000 service members since 2001 have been classified as having personality disorders and discharged, making them ineligible for many benefits. 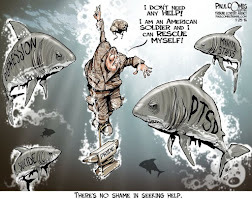 The veterans groups, represented by the veterans' clinic of the Jerome N. Frank Legal Services Organization at Yale Law School, are concerned that many of those discharged may have post-traumatic stress disorder and are therefore eligible for benefits. Porter County Superior Court Judge Julia Jent says plans are in motion to make a veterans treatment court available in the county to provide troubled veterans with assistance instead of jail time. Legislation was passed by the state last year that would allow the Indiana Judicial Center to certify veterans treatments court in any eligible county. The program falls under the umbrella of the Problem Solving Courts which includes drug court programs. Jent, who is also a member of the state’s Problem Solving Courts committee, said the veterans treatment court will apply to combat veterans who have pleaded guilty to non-violent crimes or misdemeanors. The program also includes family members of the veterans. Case managers will counsel defendants or participants in the program for alcohol and drug abuse, anger management and depression, similar to that of drug court. 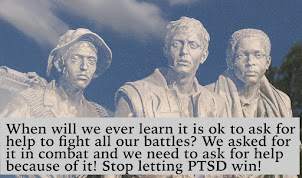 Many of the issues can be attributed to Post Traumatic Stress Disorder commonly experienced in some form by combat. Those who work with the program until completion will be able to keep out of jail and some may even see their original criminal charges dropped from their record. Jent said the program will also allow the judicial system to consult with the Army National Guard and the U.S. Department of Veterans Affairs on the personal history of an individual vet to help determine what their needs are. A 20 year old Marine faces combat, survives, returns home with PTSD and cancer, then dies of an overdose while in the hospital. There is not much this story lacks. Feres Doctrine will keep the family from filling a malpractice suit. There won't really be accountability for the fact he was in the hospital when this happened. Cancer in a 20 year old Marine and the fact that there are toxic exposures reported for years leading to cancer including the burn pits. Contaminated water and soil add to this. Their stories have been told but more are hidden. Their families suffer without justice, without answers but above all, without change for the sake of those who come after their loved one. They have prepared for the fact a bullet or bomb could end their lives but who can prepare for the government to finish what the enemy could not do? Lance Cpl. Ezequiel Freire got out of Afghanistan alive, but a stateside hospital stay proved fatal. The 20-year-old Marine's death from a prescription drug overdose at Portsmouth Naval Medical Center has left his family reeling, outraged and frustrated by what they see as an absence of accountability for those charged with his care. Freire died of a toxic cocktail of powerful narcotics and sedatives as he was awaiting chemotherapy treatment for cancer. The case underscores the dangers inherent in the many potent painkillers on the market today, which have helped drive an alarming rise in overdoses. Overdose deaths from prescription drugs now exceed those from illegal drugs. The Freire case also leaves unanswered the question of what, if any, consequences there were for the doctors involved in his care. There were ample warnings available on the drug labels and in the medical literature about the risks of the multidrug therapy that was used in Freire's case. But there is no record of any public disciplinary action against any of the doctors by the Virginia Board of Medicine. A hospital official said the case has prompted several ongoing investigations that have resulted in corrective actions. The final insult, in the eyes of Freire's family members, is that they have no legal recourse against his caregivers. That's because of a 60-year-old legal precedent known as the Feres Doctrine, which prohibits lawsuits when military service members are injured or killed by negligence. "We trusted them, and they killed him," said Federico Freire, the dead man's older brother and a fellow Marine. "It just sickens me." The Freire family moved to Bradenton, Fla., from their native Argentina when Federico was 10 and Ezequiel was 4. Back at Camp Lejeune, N.C., he was diagnosed with post-traumatic stress disorder. There was something else wrong, too. Increasingly, he was troubled by chest pains. His sister had noticed it over Christmas. When she joked with him, he'd say "Julie, stop making me laugh. My heart hurts." X-rays at the base clinic revealed a large mass in his chest. He was taken by ambulance to the Portsmouth naval hospital, where a biopsy led doctors to suspect Hodgkin's lymphoma, a type of cancer. Fallen soldiers Mom needs help taking care of other "kids" CNN gave this Mom some much needed publicity for the work she is doing not just at Christmas time but all year long. Dorine Kenney started sending boxes to soldiers 11 days after her son was killed. Now she runs Jacob's Light Foundation. Huffington Post picked up on it too. Spread the word so that Jacob's Light can shine even brighter for our deployed soldiers! It is not a 9-5 job. It is not a job where you get to decide where you are transferred to or when. It is not a job where you get to decide when you want vacation or even when you get to see your family. They belonged to their family first and then they loaned their son/daughter/husband/wife/Dad/Mom to the government for the safe keeping of the rest of us. They don't get to go home for the birth of their children or for any happy occasions they want to be a part of. These things do on without them. When it comes to a crisis in the family, they are supposed to get them home. This point the government fails to remember on a constant basis. John Lidster is one of example of this. He was serving in South Korea when his Mom was put on life support. The Red Cross managed to get him leave put now he owes the government for the cost of getting him home. TRAVERSE CITY, MI -- Monday on 7/4 News, we told you about a U.S. soldier who rushed home on Christmas day to see his sick mother. John Lidster is currently serving in South Korea. His mother is on life support at Munson Medical Center in Traverse City. It cost Lidster $2,800 to get back to home to visit his mom. As you can see here, he didn't make it all the way without the help of the State Troopers and the Patriot Guard Riders. TRAVERSE CITY, MI -- John Lidster is a soldier in the United States army. He is serving in South Korea. Halfway around the world, his mother is on life support at Munson Medical Center in Traverse City. On Christmas day, he was flown into Los Angeles, California from South Korea. He was going home to see his mother. Lidster was supposed to catch a connector flight to Chicago, but after a mix-up in customs, he missed his flight. That’s when the Patriot Guard was contacted. They arranged for Lidster to get on a later flight to Chicago. He landed just before 9 p.m. Saturday night. From Chicago, a Patriot Guard member drove him to the Indiana state line, where he was met by an Indiana State Trooper. Lidster was then rushed to the Michigan state line and a Patriot Guard member drove him back to Traverse City. John Lidster arrived at Munson Medical Center at 3:45 Sunday morning. There were 13 Patriot Guard members waiting for him in a sea of American flags. The questions this report leaves could go on forever without answers and sadly without changes. Where was the military "family" the DOD has? Where were the National Guards? Where were all the service organizations that have been operating across the country for generations? Why did it take the Patriot Guard Riders and the State Troopers to step up and get this soldier home to see his dying Mom? There are always stories about heroes and villains. Not hard to guess which is which in this story. EUGENE, Ore. - A man shot by police after firing shots at cars in a mall parking lot will not face criminal charges because he was suffering from post-traumatic stress disorder at the time of the incident, according to the district attorney. Michael Thomas Mason, 27, was in the midst of a PTSD-related meltdown when he fired a gun at cars in the Valley River Center mall parking lot, District Attorney Alex Gardner said Tuesday. "There's no reason to believe that he was even directly threatening other people," Gardner said. Bullets hit one and possibly two cars, Gardner said. Mason or his family will pay to repair the damages, he said. "Obviously firing a gun inside city limits puts people at risk," he added. "Obviously there has to be immediate law enforcement response to that. Obviously law enforcement has to prevent him from that. "When he had this meltdown, it was just that," Gardner said. "It's a meltdown, and he's not recognizing family members, he's not responsive to their conversations." Mason served in Iraq and witnessed the deaths of dozens of his fellow soldiers, his family said in a prepared statement. "We hear a lot about post-traumatic stress, and a lot of people make claims about it and in some cases where it doesn't seem to be merited," Gardner said. "There is no question but that this was a real episode." Marine home on leave, wife attacked by teens after showing of "Little Fockers"
The recent attack on a Marine and his wife outside a Florida movie theater is the latest indignity suffered by a family still reeling over the accidental death this year of a brother at a U.S. naval hospital. Federico Freire, a 28-year-old Marine, and his wife, Kalyn, were attacked Saturday by a mob of unruly teenagers after the couple asked the group to be quiet during a movie at a Bradenton, Fla., cinema, as FoxNews.com reported Wednesday. Police found Freire and his wife "battered" in the theater parking lot, and they arrested four juveniles and one adult in the violent altercation. For Freire, who had just returned from Iraq, the melee that knocked his wife to the ground was the latest woe for a family still devastated by the death of his brother, Lance Cpl. Ezequiel Freire. Ezequiel Freire, a 20-year-old Marine who spent eight months in Afghanistan, died Feb. 13 after doctors served him a deadly cocktail of narcotics and sedatives as he awaited cancer treatment at Portsmouth Naval Medical Center in Virginia, his family said. "I was the one who found him dead," Federico Freire said in an interview Thursday. "He was my brother, my best friend." Marine, wife attacked by teens after showing of "Little Fockers"
MANATEE, Fla. (AP) — A group of unruly teenagers attacked a 27-year-old Marine and his wife who had asked them to be quiet during a Christmas night showing of "Little Fockers." The attack happened as the couple left the theater near Bradenton Saturday night. Authorities say the fight attracted about 300 bystanders. Federico Freire, home on leave from Afghanistan, says they left the theater shortly after the teens were asked to leave. Tragedy added to tragedy Tuesday when an Ohio couple died in an accident on their way to help make funeral arrangements for their three grandchildren. Marc and Misty Royce of Circleville were killed in a crash on a snowy road on their way to help Marc Royce's daughter, Kacey Stacey, plan funerals for her three children, who died in a mobile home fire over the weekend, CNN affiliate WBNS-TV reported. (CNN) -- Five teenagers who died of apparent carbon monoxide poisoning in a Hialeah, Florida, motel room had gathered to celebrate a birthday, police said Tuesday. Although an official cause of death won't be released until autopsies are completed, the investigation so far shows the teenagers apparently died because they left a car with a troublesome starter running in a closed garage beneath their room, police spokesman Carl Zogby said. "Unfortunately, whoever could tell us what the intent of leaving the car on (was) is dead," Zogby said. "But we are being told by some friends that it probably had starter engine trouble." "All the evidence indicates clearly a carbon monoxide poisoning," he said, noting no alcohol or drugs were found in the room the five had rented at the Hotel Presidente. Zogby identified the dead as Juchen C. Marctial, 19; Peterson Nazon, 17; Jonas Antenor, 17; Jean Pierre Ferdinand, 16; and Evans Charles, 19. All were from the same neighborhood north of Miami, according to police. CLARKSVILLE, Tenn. — Messages are already appearing on the facades and marquees of local businesses. Many in the community are excited. About 17,000 soldiers — most of the 101st Airborne Division — are about to come home from war. Clarksville is ready to offer a warm welcome. "I'm excited for Clarksville," says Mayor-elect Kim McMillan. "They're a part of our community, and we want to do what we can." The 3rd Brigade Combat Team "Rakkasans" begin their return from Afghanistan in January. The 1st and 2nd BCTs, the 101st Combat Aviation Brigade and the 101st headquarters will be home in the spring, the 4th BCT in the summer. This return will be the largest since 2003, when most of the division returned from the initial invasion of Iraq. Before that, the largest return came after Desert Storm and Desert Shield in the Gulf War of 1990-91, when the entire division returned, according to John O'Brien, historian for the 101st. The summer of 2010 was a lethal one for the 101st, which lost 41 soldiers in Afghanistan between March and August. Nearly 400 were wounded during that time. Overall this year, the Army division known as the Screaming Eagles, formed ahead of the 1944 Allied invasion of Normandy, has lost 104 soldiers — or about 1 in 5 American deaths in Afghanistan. That is close to a toll of 105 deaths in Iraq during a 2005-06 deployment that was its deadliest year in combat since the Vietnam War. By the time the 4th Brigade Combat Team deployed in August, the division's nearly 20,000 soldiers represented 20 percent of U.S. servicemembers in Afghanistan, who are battling Taliban and insurgent strongholds in advance of the planned withdrawal. Bullet to back of head ruled suicide? How does someone decide to commit suicide by putting a bullet into the back of their head? First Sgt. Mickey Tirador’s assignment at the base meant they could share living quarters and spend the holidays together – an arrangement that most military couples would envy. But Mickey Tirador’s arrival coincided with a decline in Amy Tirador’s temperament. She started going to work late and leaving early, falling behind on her job of processing intelligence reports for Joint Base Lewis-McChord’s 3rd Brigade, 2nd Infantry Division on its last assignment in Iraq. She seemed “different and defeated,” a major who knew her later told Army investigators. Amy Tirador, 29, was found dead from a gunshot to the back of her head Nov. 4, 2009, in a small room that housed a power generator at the base. More than a year later, the cause of death – suicide or something else – is still the source of dispute between officials and her family. “Somebody cares about me” seems like such a small thing but it is what all humans need to know. Someone cares enough about them being hungry enough to feed them. Someone cares enough about them to give them a place to sleep out of the cold. Someone cares enough about them that they help instead of judging. TITUSVILLE — Jimmy Suggs lowered his head and wiped away tears as he spoke about spending Christmas away from his homeless camp in the woods on Merritt Island. “It makes me very happy somebody cares about me,” he said. 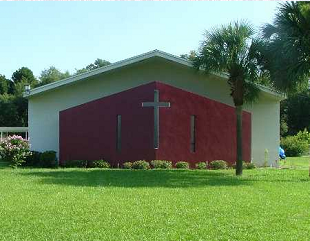 The National Veterans Homeless Support with help from the community, businesses and local churches treated Suggs and 46 other homeless veterans to two nights in motel rooms, and gave them gifts of clothes, a tent, sleeping bags and other necessities for their return to wooded camps across Brevard County. Two days ago people celebrated the day Christ was born after weeks of shopping for gifts and decorating their homes. Hours spent cooking a feast to feed family and friends. All of this for the birth of Christ when the Bible does not say when He was born while the rest of the year few care about what He said. FORT CAMPBELL, Ky. (AP) — The 101st Airborne Division, a force in America's major conflicts since World War II, is seeing its worst casualties in a decade as the U.S. surge in Afghanistan turns into the deadliest year in that war for the NATO coalition. The Army division known as the Screaming Eagles, created ahead of the 1944 Allied invasion of Normandy, has lost 104 men this year — or about 1 in 5 American deaths in Afghanistan. That is close to a toll of 105 divisional deaths in Iraq during a 2005-2006 deployment that was its deadliest year in combat since Vietnam. The 20,000-strong division from Fort Campbell has been fighting in two of Afghanistan's most violent regions, the south and the east, since it began deploying in February under President Barack Obama's plan to roll back the Taliban with more troops. This is also the first time the division has deployed in its entirety since Gen. David Petraeus led them during the invasion of Iraq in 2003. Few are as directly involved in dealing with each soldier's death as Kimberley McKenzie, the chief of Fort Campbell's casualty assistance center. Among the first to be notified after a combat death, McKenzie and her nine staffers ensure families are swiftly informed, then help them over ensuing weeks and months to navigate a bureacratic maze of paperwork and decisions. "We can get the calls at 2 o'clock in the morning, and that happens seven days a week," she said. In her office, signs of the somber work are everywhere. Electronic bugles — which now replace live renditions of taps at many military funerals — are lined up in cases. A folded American flag, ready to be presented to a wife or a mother, sits on a desk. Wooden ceremonial display cases for a soldier's awards and decorations are stored atop filing cabinets. A large whiteboard on one wall displays the names of dozens of soldiers who have died this year. McKenzie, 46, has been doing this job at Fort Campbell on the Tennessee-Kentucky state line since the 1990s, through the Desert Storm and Desert Shield operations against Iraq in 1990 and 1991 to the current wars in Afghanistan and Iraq. "I have been here so long, which can be a blessing and a curse because you know so many of the soldiers," she said. After the initial call, her team hurries to find a soldier's family. From the moment the death of a soldier is confirmed with the Department of the Army, regulations give them just four hours to notify the primary next of kin. Often it's a nationwide search for parents or spouses who are far from Fort Campbell. A family may have moved and not told the Army, listed information may be incorrect or the soldier may be estranged from relatives. Too often, she says, a family member is listed as "address unknown." Jose Pagan is a decorated veteran who survived two tours of duty in Iraq as a road clearance specialist. Just three days after leaving the military he was homeless and living on the streets of the Bronx. Jose says being homeless after his service is something he never would have imagined. "It was embarrassing," Pagan says. 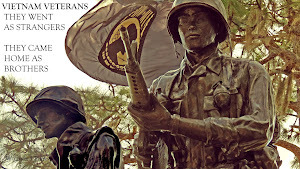 "Honor, pride, duty, loyalty, all these things that we -- that kick in as a soldier, you know. And then to find yourself here," as he points to the park benches where he slept for almost two months. Pagan is one of an estimated nine thousand returning servicemembers from Iraq and Afghanistan that the Department of Veterans Affairs estimates have been homeless. AMANPOUR: IN THIS SEASON OF GIVING, SOME OF THOSE WHO HAVE GIVEN THE MOST, FIGHTING FOR THEIR COUNTRY HAVE COME UPON HARD TIMES. RETURNING TO THE HOME OF THE BRAVE, FOR THOUSANDS OF MILITARY VETERANS, HAS MEANT NO HOME AT ALL. MANY VETERANS OF AMERICA'S WARS IN IRAQ AND AFGHANISTAN ARE FINDING THEIR TRANSITION TO CIVILIAN LIFE OVERWHELMING. 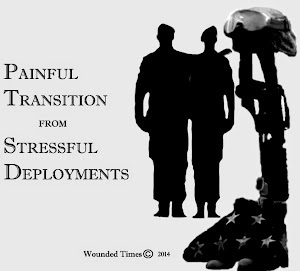 SOMETIMES COMPLICATED BY POST TRAUMATIC STRESS DISORDER, SUBSTANCE ABUSE, UNEMPLOYMENT AND DIFFICULTY ADJUSTING TO ORDINARY LIFE AFTER THE EXTREME ENVIRONMENT OF COMBAT, THOUSANDS OF VETERANS HAVE BEEN LEFT HOMELESS. This is a good start in addressing the growing justice crisis but while Scott's advisors are looking at pro-active ways of reducing the inmate population, they also need to look at a huge factor they are not talking about. Our veterans. TALLAHASSEE — Conservatives have been known to be tough on crime. Now they're saying they have to be tough on criminal justice spending as well. Rick Scott's "law and order" team is telling Florida's incoming governor, who considers himself a conservative's conservative, to cut costs by diverting nonviolent offenders to drug treatment and requiring inmates to get an education and vocational training. Those actions, which the transition team said could reduce the number of criminals returning to prison and allow the state to stop building new prisons, sound more like past Democratic suggestions than traditional conservative approaches to criminal justice. But that's exactly where Florida may be headed, following a new national movement heralded by conservatives such as Newt Gingrich, Grover Norquist and William Bennett. They are among a host of dramatic changes that Scott's transition teams for Florida's government proposed last week as he prepares to take office . His inauguration is Jan. 4 in Tallahassee. But the criminal justice ideas also are unique among the teams' recommendations in their departure from traditional Republican views. Instead of the "lock 'em up" approach to crime, the new recommendations echo the advice social progressives have been trying, unsuccessfully, to put in place for years - spend less on prisons and more on treatment, intervention and prevention. Scott's advisers suggested a radical revamp of the state's criminal justice system, which houses more than 100,000 prisoners and has swelled by more than 1,000 percent during the past four decades. Faced with bulging prison populations and a rate of one in three prisoners winding up back behind bars, the advisers concede that being tough on crime hasn't worked. On top of that, there are ever-tightening budgetary constraints. Fiscal conservatives realized that "we were not only not getting good value for the money being spent, but getting bad value and bad results," said Linda Mills, a criminal justice consultant who served on Scott's transition team for law and order. Then law-and-order conservatives began to accept similar conclusions about mandatory- minimum sen tences and other tough-on-crime laws, Mills said. Some, she said, even have publicly asked for forgiveness for having played a part in exploding prison growth. Now they are leading the charge toward rehabilitation. 20 States already have them. 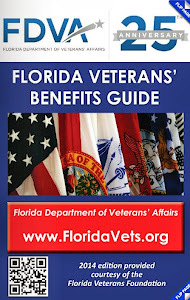 According to the Florida Department of Veterans Affairs 1.7 million veterans were residing in Florida in 2009 which would make sense for Florida to have Veterans Courts added to what they want to do to take care of veterans instead of locking them up. Williamsburg, Va. (Nov. 11, 2010) — Throughout the U.S. today, ceremonies, parades, and other special events are taking place to honor the nation's war veterans. But every day, a growing number of our country's state courts are recognizing veterans in a very different and significant way — by establishing specialized courts and programs designed to address the social and legal issues associated with servicemen and women. Currently at least 20 states have veterans courts: Alabama, Alaska, Arizona, Arkansas, California, Colorado, Georgia, Illinois, Michigan, Minnesota, Missouri, Nevada, New York, Ohio, Oklahoma, Oregon, Pennsylvania, Texas, Washington, and Wisconsin. At least 10 other states are considering the issue either through studies or proposed legislation. It was a typical morning in Afghanistan and Spc. Nicholas Robinson was just about finished with a six-hour guard duty shift at an Afghan police compound near his combat outpost. A mortar round landed roughly 20 meters in front of his guard tower. Over the next seven minutes in the first combat action he had seen, Robinson killed one insurgent carrying a rocket launcher and then held off 15 to 20 insurgents, killing two of them. One of them was a suicide bomber who got to within 50 feet of Robinson. For his heroism and bravery, Army Chief of Staff George Casey presented Robinson Thursday with a Silver Star, the Army’s third highest award for valor in combat. AT KANDAHAR AIRFIELD, AFGHANISTAN Most of the time, this war-theater hospital crackles with danger and expertise, its staff members working to keep alive people who would be dead if they ended up almost anywhere else in the world. But some of the time, often in the morning, it's quiet and almost empty, except for a few recuperating Afghans stoically watched over by family members and, today, a young girl in a pink robe exploring the corridor outside her room in a wheelchair. The hospital, which opened in May and is owned by NATO, is an odd mix of urgency and relaxation. It features patients whose stays inside its $40 million walls are both shorter and longer than any in contemporary U.S. hospitals. American soldiers critically injured on the battlefield spend only a day or two here, many unconscious and on ventilators, before being sent to Bagram air base, then to a hospital in Germany and on to the United States. At the other end of the continuum are the Afghans who make up about half the patients. SOMERSWORTH — Four-year-old Anthony Griffin's eyes lit up when he saw the fire engine climb the hill toward his apartment on Winter Street. Then suddenly a grin stretched across his face when he noticed who was inside. Right in the front was Santa Claus, waving at him. As Santa stepped from the engine, Anthony rushed over and into his arms, and that's when he noticed the figure who had followed Santa out of the fire engine. The man knelt on the ground, trying to hold back tears, as Anthony then flew into his arms. This would be the first Christmas he'd spend with his uncle since 2008. The Somersworth Fire Department, with help from Santa and an elf, made a special trip on Christmas Eve day to deliver 22-year-old Marine Lance Cpl. Matthew Sanborn home after he was away for two and a half years. "I'm supposed to be the toughest of the tough, and I'm about to cry," Sanborn said about seeing his family again. A couple of weeks ago, firefighter James Drakopoulos was on duty when he received a phone call from Sanborn asking for help surprising his nephew with his homecoming. "A lot of the guys (on the fire department) are veterans," Drakopoulos said, adding that he didn't hesitate to assist. "And we usually try to help whoever we can with what they need ... Everyone was willing to do whatever they could. These guys are serving our country." Sanford spent his first year away from home in training, and then during his second year, he was deployed with the 24th Marine Expeditionary Unit. He spent time in Haiti after the earthquake hit, and then wen to Djibouti, Africa, and Jordan. He returned to the states in August, where he was stationed at Camp Lejeune in North Carolina. "Not a day goes by when I don't think about them or what they're doing," the lance corporal said. "The value of the sword is not that it falls, but rather, that it hangs." There is a hidden war going on in this country that few are talking about. 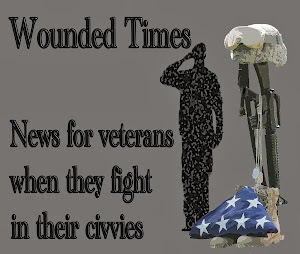 While news reports finally spread the growing crisis of veterans returning home with PTSD, seeing their lives fall apart, these cases are usually attributed to combat operations. 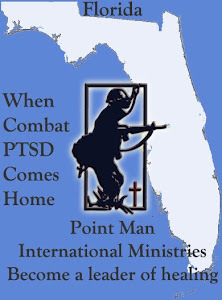 A few days ago Dana Morgan, President of Point Man Ministries, and I were talking about this other hidden crisis. The soldiers sent for humanitarian relief operations are more affected by what they witness. FAYETTEVILLE, N.C. — A man who shot himself Thursday outside the Fayetteville Police Administrative Building was a Fort Bragg soldier, according to the post. Spc. Freddy J. Hook, 20, of Maurice, La., was a healthcare specialist with Company C, 407th Brigade Support Battalion, 2nd Brigade Combat Team. He had been stationed at Fort Bragg since Sept. 2009. His most recent deployment was for earthquake relief in Haiti in January. Hook shot himself on Hay Street shortly before 6 a.m. Thursday. He died at Cape Fear Valley Medical Center on Saturday, police said. This happens. What they see is not something they can fight against. There is no battle plan to defeat a natural disaster. They also see death on a massive scale followed by suffering survivors waiting for help. There are many post I think about often but at this time of year a post I did back in March seems to fit very well with what Christmas is supposed to be. It is supposed to be a day of making others feel loved and that is exactly what a church did for a homeless Vietnam Vet and he returned the love to them. He passed away in March but his life touched so many that I wanted to post this story again. 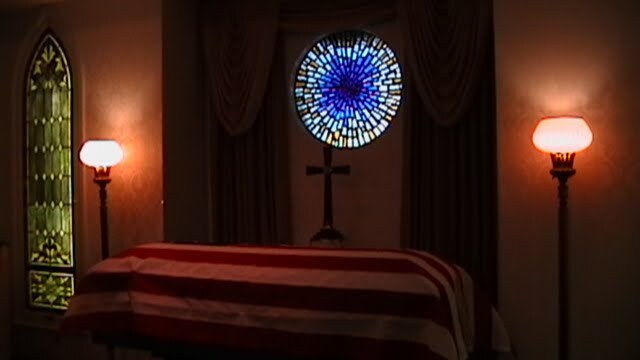 A simple casket with an American flag for Vietnam Veteran Andrew Elmer Wright. 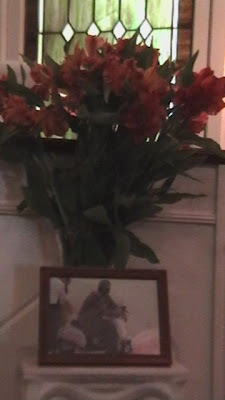 A simple bouquet of flowers was placed with a simple photo a church member snapped. By all accounts, Andrew was a simple man with simple needs but what was evident today is that Andrew was anything but a "simple" man. 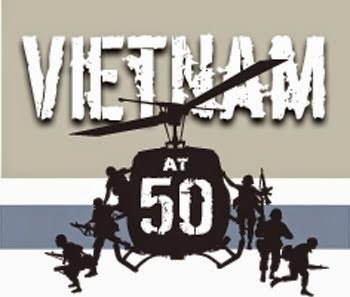 A few days ago I received an email from Chaplain Lyle Schmeiser, DAV Chapter 16, asking for people to attend a funeral for a homeless Vietnam veteran. 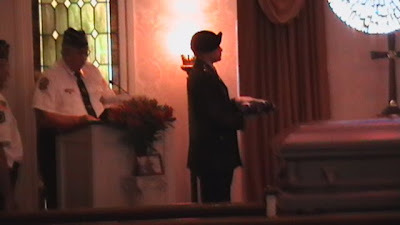 After posting about funerals for the forgotten for many years across the country, I felt compelled to attend. As I drove to the Carey Hand Colonial Funeral Home, I imagined an empty room knowing how few people would show up for a funeral like this. 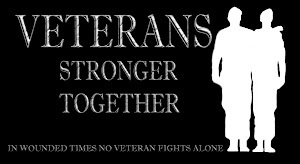 All the other homeless veteran stories flooded my thoughts and this, I thought, would be just one more of them. When I arrived, I discovered the funeral home was paying for the funeral. Pastor Joel Reif, of First United Church of Christ asked them if they could help out to bury this veteran and they did. They put together a beautiful service with Honor Guard and a 21 gun salute by the VFW post. I asked a man there what he knew about Andrew and his eyes filled. He smiled and then told me how Andrew wouldn't drink the water from the tap. He'd send this man for bottled water, always insisting on paying for it. When the water was on sale, he'd buy Andrew an extra case of water but Andrew was upset because the man didn't use the extra money for gas. Then Pastor Joel filled in more of Andrew's life. Andrew got back from Vietnam, got married and had children. His wife passed away and Andrew remarried. For some reason the marriage didn't work out. Soon the state came to take his children away. Andrew did all he could to get his children back, but after years of trying, he gave up and lost hope. A few years ago, after going to the church for help from the food pantry, for himself and his cats, Andrew lost what little he had left. The tent he was living in was bulldozed down in an attempt to clear out homeless people from Orlando. Nothing was left and he couldn't find his cats. Andrew ended up talking to Pastor Joel after his bike was stolen again, he'd been beaten up and ended up sleeping on church grounds in the doorway. Pastor Joel offered him the shed in the back of the church to sleep in so that he wouldn't have to face more attacks. The shed had electricity and they put in a TV set, a frying pan and a coffee maker. They wanted to give Andrew more but he said they had already given him enough. Pastor Joel told of how Andrew gave him a Christmas card with some money in it one year. Pastor Joel didn't want to take money from someone with so little, but Andrew begged him to take it saying "Please, don't take this away from me" because it was all he had to give and it meant a lot to give it to the Pastor. Much like the widow with two cents gave all she had in the Bible, Andrew was truly grateful for what little he had been given from the church. What was soon made clear is that Pastor Joel gave him even more than he imagined. Andrew took it on himself to be the church watchman. While services were going on after Andrew greeted the parishioners, he would travel around the parking lot to make sure the cars were safe. At night he made sure any guests of the church were equally watched over. Pastor Joel not only gave him a roof over his head and food, he gave him something to make him feel needed. More and more people came to the service and there was a lot of weeping as Pastor Joel spoke. What was very clear this day is that Andrew was called a homeless veteran but he was not homeless. He found one at the church. He lost his family and his children, but he found a family at the church. From what was said about Andrew, he was a Vietnam veteran with PTSD and he wanted no help from the VA. Too many of them feel the same way and they live on the streets, depending on the kindness of strangers to help them out. Andrew wasn't one of the panhandlers we see in Orlando. He refused to beg for money and he wanted to work for whatever he was given. His health got worse but he still did what he could. Right up until March 16, 2010 when Andrew passed away, no matter what happened to him during his life, Andrew proved that this veteran was not hopeless, not helpless because he found the fulfillment of hope in the arms of strangers who took him in and he found help as he asked as well as gave. The legacy of this homeless veteran is that he touched the lives of so many hearts and will never be forgotten. Behind this church, in a tiny shed, Andew spent his last hours on this earth. Born in Riverside Park NJ on November 5, 1938 he returned to God on March 16, 2010. In my Father's house are many rooms; if it were not so, I would have told you. I am going there to prepare a place for you. And if I go and prepare a place for you, I will come back and take you to be with me that you also may be where I am. If you can understand the need for something like this after one event, then maybe you can understand a soldier coming home needing help after a year's worth of events when their lives were on on the line. PANAMA CITY — Everyone involved in the hostage crisis at the Bay District Board room has a buddy. It was one of the first things Superintendent Bill Husfelt ordered, along with time with a counselor for all the board members shortly after Clay Duke pulled out a gun during a Dec. 14 board meeting and ultimately opened fire on the board. The 56-year-old was shot by Mike Jones, the district’s chief of safety, security and police. Duke fell to the ground, returned fire and then turned his gun on himself. No one besides Duke was physically hurt but officials are concerned that the emotional and psychological scars could linger. Those who survive a traumatic event sometimes suffer from acute stress disorder, said Omar Howard, a psychiatrist with Life Management Center in Panama City. “They have intense fear, feelings of helplessness or horror,” Howard said, adding that victims often have nightmares, problems sleeping, anger issues. They may also avoid the source of the trauma and if the incident was videotaped, like the hostage situation, they may avoid watching the video. LEAVENWORTH, KAN. — Her prayer went unanswered. At a September rally in Leavenworth, Vicki Behenna from Edmond, Okl., gave details about her son’s court martial, conviction and appeal. The Behenna family was disappointed Wednesday to learn their son’s Dec. 2 appeal to the Army Clemency and Parole Board was denied. They had hoped for a suspended sentence and immediate parole in time for Christmas. Letters of support from the Governor of Oklahoma, the Oklahoma Attorney General, and the entire Oklahoma Congressional Delegation had no effect. Three letters offering immediate employment upon his release had no effect. A decision from the Army Court of Criminal Appeals from a hearing on Dec. 9 may not be known for 3 to 15 months. Michael’s family and a courtroom of supporters drove many hours to attend that hearing in Arlington, Va.
Vicki Behenna and her husband Scott travel to Leavenworth most weekends and are spending as much time as allowed with their son on Christmas Eve and Christmas Day. DAYTON, Ohio -- Family and friends of a paralyzed Air Force veterans, brutally killed, visited the site where his body was found on Wednesday. William Boykin, 66, was found slain inside his own van that was parked in an alley off Ferguson Ave..
Today, family members continued voicing their hope that those responsive will come forward. At an afternoon prayer vigil, the victim's brother spoke out. He said Boykin was paralyzed from the waist down after back surgery so he was defenseless. Paul Boykin said, "I kinda wish I could have been with him, then they would have found two in the van instead of one. I would have been back to back with him. i feel like my brother was that way. If it was one of us, he would have stayed with us through thick and thin." Family members believe Boykin was murdered over money that he had saved to give his 16 grandchildren for Christmas. "We just hope this thing doesn't happen anymore. We have to start caring for one another instead of destroying one another," said Paul Boykin. ROSEWOOD HEIGHTS, Ill. — A Vietnam veteran is spending Christmas in the first home he ever has owned, thanks to the generosity of a fellow soldier from that war. 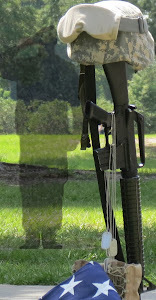 Retired Army Sgt. 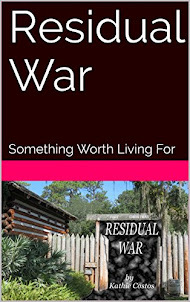 First Class Frederick Evanik, who is dying from lung cancer, decided to deed his trailer home to another veteran of the conflict, Steve Brown, who had been renting a room in a nearby trailer at Oak Ridge Trailer Park for several years. Serving in Vietnam from 1968 until 1971, Brown had been a specialist in the Army; he drove fuel trucks. Although Evanik and Brown served in both Vietnam and Germany, they did not meet one another until about four years ago. "It's amazing that he would do this for me," Brown said. "I was fixing to be in the streets once Gary (Paulding), the owner of the trailer I had been living in, put his up for sale this spring." Wars are evil things. People try to kill other people. The win comes when more of the other side have died than the side you are on and that is the mission of the men and women sent. They see so much death and destruction, civilians killed and friends die that they wonder how the loving God they always thought they knew would allow any of it. Where was He? 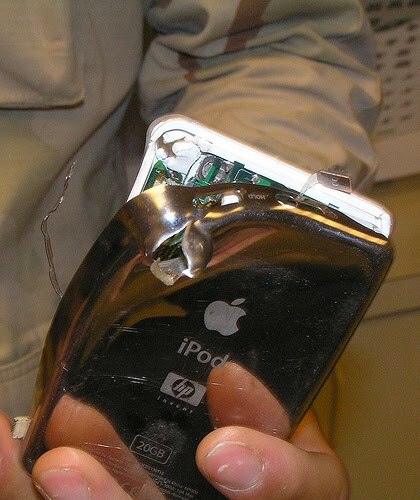 He was there when an Ipod in a pocket saved this soldier's life. In miracles when a bomb did not blow up. When a bullet missed. 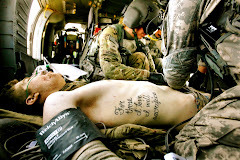 He was there when a soldier was saved by the medic. With so many bombs blowing up, bullets cutting down soldiers and lives not saved by medics it is hard to figure out how some live and some die but in living these are things we never know. How does a child die yet some people live past 100 years on this earth? How does a man make it home from combat only to die in an accident back home or a victim of a crime? To think God had forsaken them is easy but if they look they will see the love they feel for each other. In the midst of evil love lives on, stronger than anger and hatred. How can love live within their hearts while they are surrounded by death? It is because God is there when they are able to feel compassion, shed a tear, say a prayer and when they are still able to grieve over a fallen friend. He is there when they risk their lives to save someone else. He was there when simple men fought to save others after they were wounded and we call they heroes presenting them with a Medal of Honor or to the families of the fallen who paid the price so that others may live. God was there when a hand reached out to help, to comfort and when a knee was bent in prayer. He was there when a family back home stood near a flag draped coffin and they were surrounded by love. For Christians around the world today, Christmas Day, it is not a holiday but a holy day when the birth of Christ is celebrated but for the rest of the year we forget about one of the last things Christ did was to forgive the hands that nailed Him to the cross. God was there that day too. So many believe things they have done in their lives, especially during war, are unforgivable. The horrific memories grow stronger over the years and the tender moments when the love they felt was all that mattered are forgotten. They cannot believe God could ever care about them again, yet He does now just as He did then. Christ made the dead live again, but they killed. He made the lame walk again but they made some lame. He made the blind see again, but they made some blind. 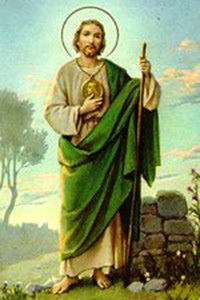 He took care of the poor and needy but they took away homes with bombs, made widows and orphans. These thoughts take over the reason they were there in the first place. They went to fight the enemy trying to kill the people they went to save. They went in the place of the President and Congress deciding it had to be done. They went to serve the country they loved and to fight next to their brothers so that more of them would come home when it was over. They forget what was in their hearts but God did not forget that it was not out of hatred, but out of love they were willing to lay down their lives so that others may live. 1 “I am the true vine, and my Father is the gardener. 2 He cuts off every branch in me that bears no fruit, while every branch that does bear fruit he prunes[a] so that it will be even more fruitful. 3 You are already clean because of the word I have spoken to you. 4 Remain in me, as I also remain in you. No branch can bear fruit by itself; it must remain in the vine. Neither can you bear fruit unless you remain in me. During the foreign soil wars they were sent to save lives in other countries. They were willing to die in order to do it. There was no evil inside of them in what began their journey but when they came home they began to feel as if they were. They return feeling forsaken by God, not understood by family and friends and then forsaken by the rest of the country when they have a need to be taken care of. Being forsaken becomes a part of them and love is pushed away until they find that God was there all the time right by their side when love lived on no matter what they had to do and what they had to go through. During the first week of the war in Iraq, a Military Times photographer captured the arresting image of Army Spc. Joseph Patrick Dwyer as he raced through a battle zone clutching a tiny Iraqi boy named Ali. 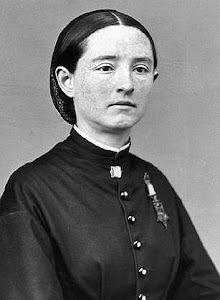 The photo was hailed as a portrait of the heart behind the U.S. military machine, and Doc Dwyer’s concerned face graced the pages of newspapers across the country. But rather than going on to enjoy the public affection for his act of heroism, he was consumed by the demons of combat stress he could not exorcise. For the medic who cared for the wounds of his combat buddies as they pushed toward Baghdad, the battle for his own health proved too much to bear. On June 28, Dwyer, 31, died of an accidental overdose in his home in Pinehurst, N.C., after years of struggling with post-traumatic stress disorder. 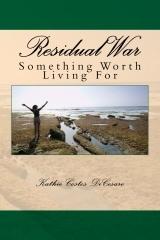 During that time, his marriage fell apart as he spiraled into substance abuse and depression. 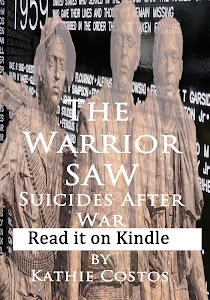 He found himself constantly struggling with the law, even as friends, Veterans Affairs personnel and the Army tried to help him. The day he died, Dwyer apparently took pills and inhaled the fumes of an aerosol can in an act known as “huffing.” Thomas said Dwyer then called a taxi company for a ride to the hospital. When the driver arrived, “they had a conversation through the door [of Dwyer’s home],” Thomas said, but Dwyer could not let the driver in. The driver asked Dwyer if he should call the police. Dwyer said yes. When the police arrived, they asked him if they should break down the door. He again said yes. Dwyer served in Iraq with 3rd Squadron, 7th Cavalry Regiment as the unit headed into Baghdad at the beginning of the war. As they pushed forward for 21 days in March 2003, only four of those days lacked gunfire, he later told Newsday. The day before Warren Zinn snapped his photo for Military Times, Dwyer’s Humvee had been hit by a rocket. About 500 Iraqis were killed during those days, and Dwyer watched as Ali’s family near the village of al Faysaliyah was caught in the crossfire. he grabbed the 4-year-old boy from his father and sprinted with him to safety. Zinn grabbed the moment on his camera. The image went nationwide and Dwyer found himself hailed as a hero. When love lives on, God is there. When they can find the ability to still care, God is there. Until the day comes when there is peace on this earth, there will be men and women stepping up out of love willing to lay down their lives for others. Pray for those we send until that day comes when man shall kill man no more. If you want to assume veterans are treated by the VA for free, think again. Until there is a service connected rating, they are charged for treatment unless their income is too low. For too many veterans they will hear from a VA doctor they are suffering because of their service but until their claim is approved, they are not covered. The other factor is that private insurance companies will turn down claims for mental health as soon as there is a diagnosis linking it to service. How do I know this? 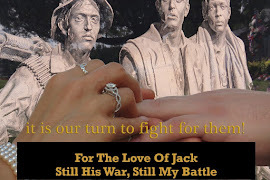 My husband's claim took six years to become service-connected, years after a VA doctor said it was and even more years after a private psychologist said it was. The VA charged for his care because his claim was not approved yet. Our insurance company said they would no longer cover mental healthcare for him because it was the responsibility of the government to treat him. This all ended up leading the VA to take our tax refund to cover what we couldn't pay for. Once his claim was approved, we got back most of the money but the stress and heartache of getting from admitting he needed help to having the need covered was a nightmare. What New Jersey legislators want to do is very much needed! TRENTON — Legislation to provide an income tax credit to veterans who require psychological counseling and treatment upon returning home from war has been passed by the state Senate. Senate Majority Leader Barbara Buono said her bill would help prevent suicides by returning Iraq and Afghanistan veterans who are suffering from Post Traumatic Stress Disorder (PTSD). The murder rate for Fort Carson troops is dropping. The suicide rate is too. 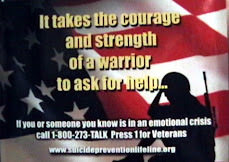 So is the rate of soldiers locked in the local mental hospital for suicidal or homicidal thoughts. Army officials say it is because changes made in the last few years are finally taking hold. And when Army brass come to tour Fort Carson looking for the keys to the success, they often stop in the office of a friendly, young psychologist named Captain Katie Kopp. Kopp, 29, is the behavioral health officer for the 4th Infantry Division’s 4th Brigade Combat Team — basically a combat shrink. When the brigade spent 12 months in the remote mountains of southeastern Afghanistan in 2009 and 2010, she was there with them, helicoptering through war-torn valleys to tend to soldiers at outposts. In areas too dangerous for helicopters, she jumped supply convoys that often attracted rifle fire and rocket attacks. “It gives me street cred with the Joes,” she said recently with a slight laugh. But seriously, she added, spending a year in the those valleys enables her to relate to the men she is now counseling for post-traumatic stress and other psychological wounds. Deploying a shrink with a brigade is nothing new. What’s new is that Kopp is still with them. In the past, most psychologists showed up just before the deployment and left days after the brigade got home. 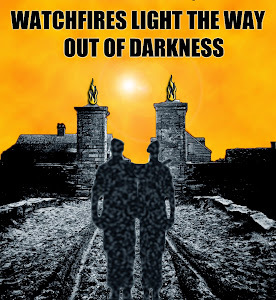 They weren’t there to help with the often turbulent months after soldiers return. Kopp will stay with the brigade until it deploys again, and perhaps longer. That change, and many like it, are designed to address the problems that kept soldiers who needed help from being identified, and kept soldiers who identified themselves from getting help. At the start of the Iraq war in 2003, Fort Carson had little recent experience dealing with soldiers returning from combat and few mental health professionals. A third of mental health staff positions were unfilled. As the war escalated, so did the amount of cases. By 2007, the number of soldiers being treated for post-traumatic stress at Fort Carson had jumped more than 700 percent. Soldiers waited weeks to see a therapist, often only to be handed a drug prescription. Soldiers caught for drug and alcohol abuse and sent for treatment usually never got it. At the same time, countless soldiers never were identified as needing help at all. Many saw post-traumatic stress disorder as a weakness, or worse, a made-up excuse for cowards. Some soldiers were berated or punished by their sergeants for trying to seek help. Tripped up during the campaign by the revelation that he exaggerated his military record, U.S. Sen.-elect Richard Blumenthal, D-Conn., is seeking a seat on Senate Veterans' Affairs Committee. Blumenthal, 64, plans to use the clout of his new office, which he will assume on Jan. 3, to champion improvements to the social safety net for veterans. "The goal is to keep faith with our veterans and keep our promises to them," Blumenthal told Greenwich Time Friday during a wide-ranging interview on his transition from longtime state attorney general to senator. Blumenthal will call for a comprehensive No Veteran Left Behind program when he fills the seat of fellow Democrat Chris Dodd, who is retiring. 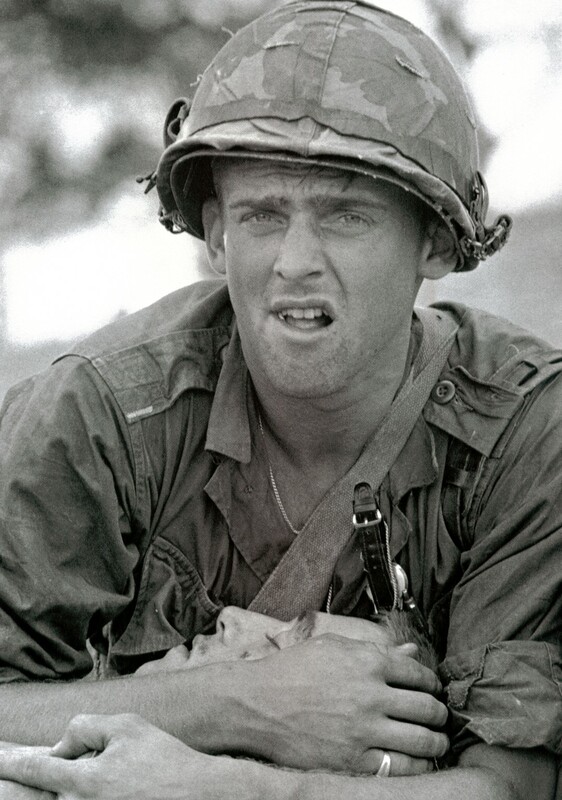 "Essentially, No Veteran Left Behind is a program that I've advanced, along with others, to improve job training, educational opportunities, employment openings and health care for veterans, including aid for homeless veterans," said Blumenthal, who served in the U.S. Marine Corps Reserve during the Vietnam War but did not see combat. Jimmy Sparrow, 63, a veterans' advocate from Stamford who was a Marine Corps rifleman in Vietnam, said Blumenthal wholeheartedly deserves to be on the committee. "He's always, always been a friend of the veterans," Sparrow said. "I think he would be an excellent choice. This thing that happened, clearly he misspoke, and they're making a big deal about it." An atheist billboard on the New Jersey side of the Lincoln Tunnel that declared Christmas a "myth" has been replaced by a pro-Christian billboard. 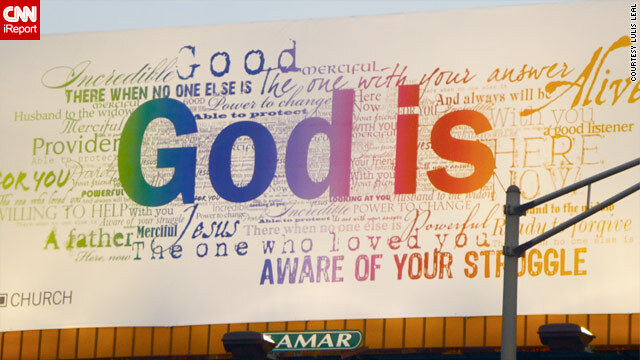 The old billboard, put up in late November by the American Atheists organization, said "You know it's a myth. This season, celebrate reason." The sign stirred controversy among Christian organizations, prompting the Catholic League to erect its own pro-Christmas billboard on the New York side of the tunnel that read, "You Know It's Real: This Season Celebrate Jesus." The new sign, which was posted by the Manhattan-based Times Square Church, reads "God is," and includes a word cloud of religious themes. Three days a week, Yale sophomore James Campbell rises at 5 a.m. for ROTC drills on a college campus that isn’t his own. He would gladly do push-ups and run circles on Yale’s campus. But even if that were an option, he wouldn’t have much company. Campbell is Yale’s only Army ROTC cadet. Like other ROTC members who attend colleges that do not host the program, Campbell trains at another school — in this case, the neighboring University of New Haven. Because Yale does not fully recognize ROTC, he does not earn any academic credit toward his Yale degree for the military science course he must take at New Haven for his commission.